BROEN Emergency Shower Systems are a world leader in the supply of emergency showers, eye washers and safety equipment to professional laboratories, the education sector and industrial workplaces. Our complete solutions are designed and developed for dynamic workplaces, and the system is modular so that transport and installation are as simple as possible. Our safety installations meet all the regulatory requirements and have clearly- marked instructions. They are quick and easy to use, ensuring optimum pain relief in an emergency situation. We give advice on usage, maintenance and testing, so you can be sure your solution works when it is required to. BROEN has developed the best emergency shower head on the market. It ensures the optimum cascade and spread of water in the event of an accident. The shower head is self- draining so there is never unclean water in the shower head. This also saves on the time needed to test and service the emergency shower and avoids water spills. 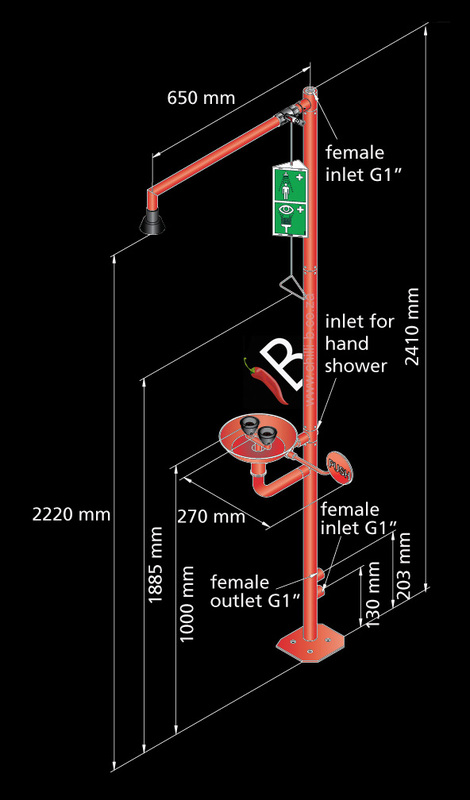 Every BROEN emergency shower system is designed and made for ease of use, allowing the injured person to use both hands, so they can hold their eyes open in the shower, undress, or simply rinse the affected area more efficiently. BROEN REDLINE emergency showers and eye washers meet the European Committee Standardization requirements DS/EN 15154 1 and 2. Modular body shower with eye/face shower and bowl. 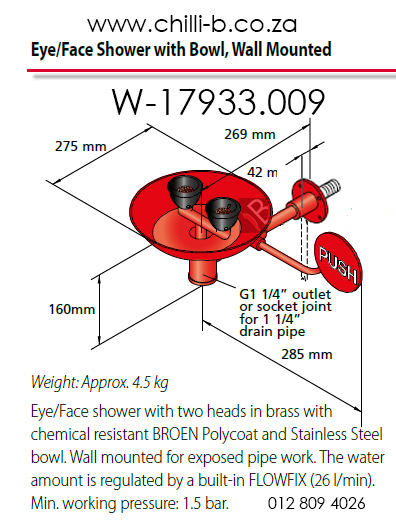 In brass and Stainless Steel with chemical resistant red BROEN Polycoat with self- draining shower head. Eye wash with built- in. FLOWFIX for regulation of water flow (26 l/min). Bowl in Stainless Steel with integrated outlet. Min. working pressure: 1.5 bar.